is cultural tradition of people in this ancient town for centuries. This special cultural activity attracts the participation of visitor in domestic and abroad coming to Hoi An. The festival is is held on every 14th day of the lunar month. According to local people it is the time to honors their ancestors and to pray for health and wealth. It is unfortunate if somebody used to come Hoi An but has not been witnessed this festival as it be organized only once a month. For preparing, local people make Lantern from 3 days before the full moon day. On this day, the city becomes so crowded and noisy. 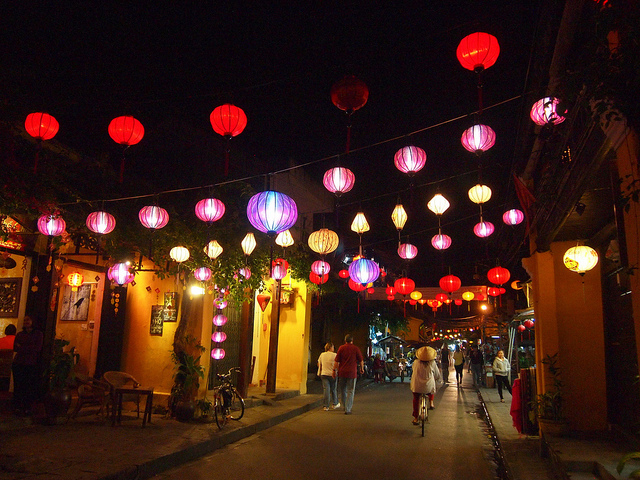 Especially, the ancient town is decorated splendid with colorful feature of lantern. At special moments, all the electric light will be switched off, and the lanterns lighten up. All the town seems to be turn back to the centuries ago when people did not depend on machine. The air is fresh and cool, scenery becomes blurry mystery. Sitting in a boat drifting slowly in Hoai River, visitor can see an amazing spectacle. 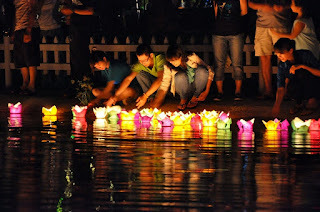 The colorful lanterns are floating in the water, splendid lights in all the street is reflected by river surface. All the lights are blending create a painted beauty. Many domestic and abroad tourists visit Hoi An at this occasion. Everyone wants to take picture in beautiful view of Cau Pagoda or Hoai River, so it is not easy to choose an ideal place for posing photos. Therefore, many tourists come here earlier to eat some specialties and keep a nice view foothold. Every faces become brighter under the splendid lantern. 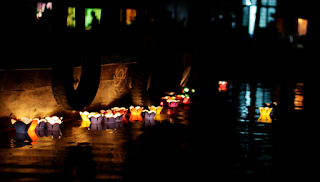 At Hoi An Full Moon Lantern Festival night, in all streets there are many children selling some handmade paper flower. 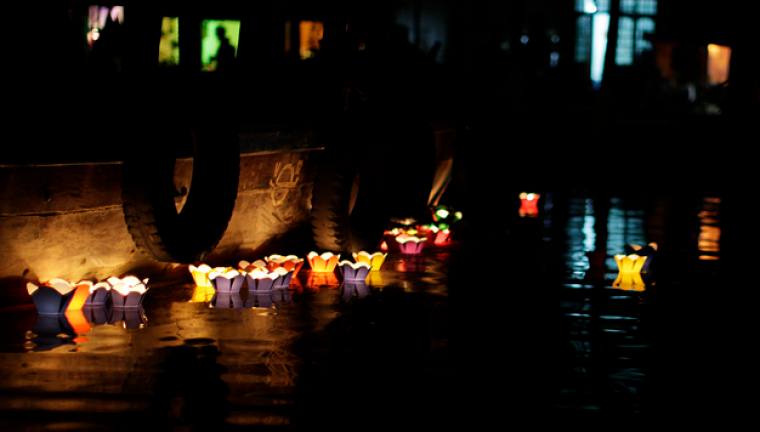 Those are simple flowers which have hexagon shape and contain a candle light inside. Each flower costs 5 thousands dong. It is very cheap but very meaningful. 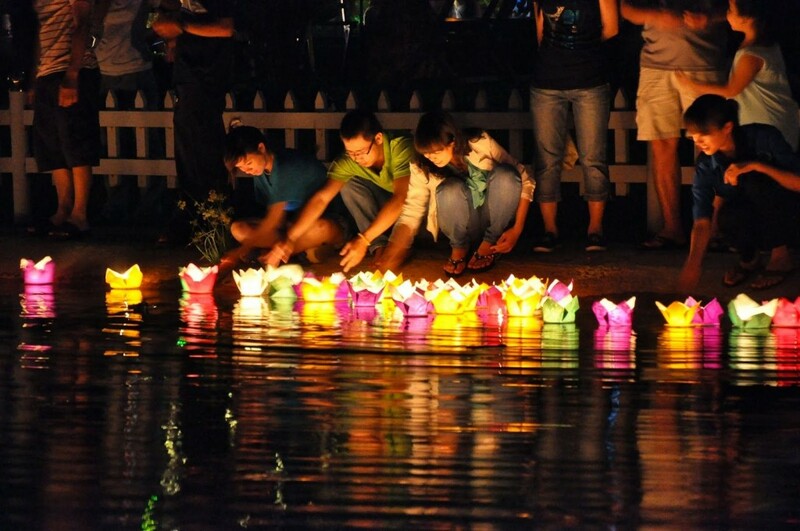 Visitor will buy one lantern and wish something for your own and family then flow it away along with the river. In this ancient town, all the motorbike and car is banned, so visitor can freely walk down the street without worrying about traffic. 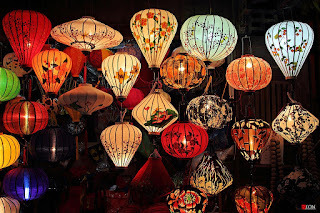 In all pavements you can easily find many small souvenir made by skilled hand of Hoi An people. Those tiny gifts are made from fabric or ceramic which have shapes characterized by cultural traditions. Although in festival night, Hoi An old town still retains its quiet, gentle, peaceful features. Because of this lifestyle, every activities of festival is stopped at 10pm. After 11pm, all lantern light replaced by little light of peddlers. Some visitors want to stand longer in the river bank to admire the quiet and peaceful old town, and enjoy some specialties of Hoi An.